You'd be forgiven for thinking that this post is about our dear little Tobias, who is indeed now the baby of the family. 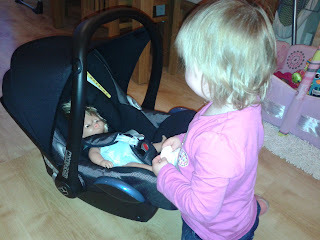 However, this post is actually about Baby, my daughter's dolly that she totally adores. Baby is actually Tiny Tears - MY Tiny Tears from when I was a child - which E stole from me found one day while I was clearing out some boxes and bags. Knowing how much she loves her dollies (that's all that nursery tell me these days...) I decided to let her play with it. I figured I'd sneak it away when she wasn't looking. 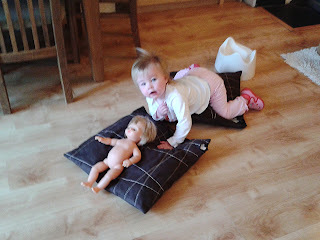 Surely she wouldn't miss a doll that she's played with for only 10 minutes, right? Wrong! The first thing E asked for the next morning was Baby and she got very upset when I told her that I couldn't find the dolly. In fact, she got so upset that I caved and got Tiny Tears out and she has been attached to Elizabeth ever since. Since Toby came along, Baby has been a much bigger focal point for Elizabeth. She copies everything I do with Toby and so Elizabeth is now very much Baby's Mummy. Baby gets put to sleep in the rocking chair, she gets swaddled in her blanket, she even gets breastfed! That one was a bit of a shock the first time I saw it! 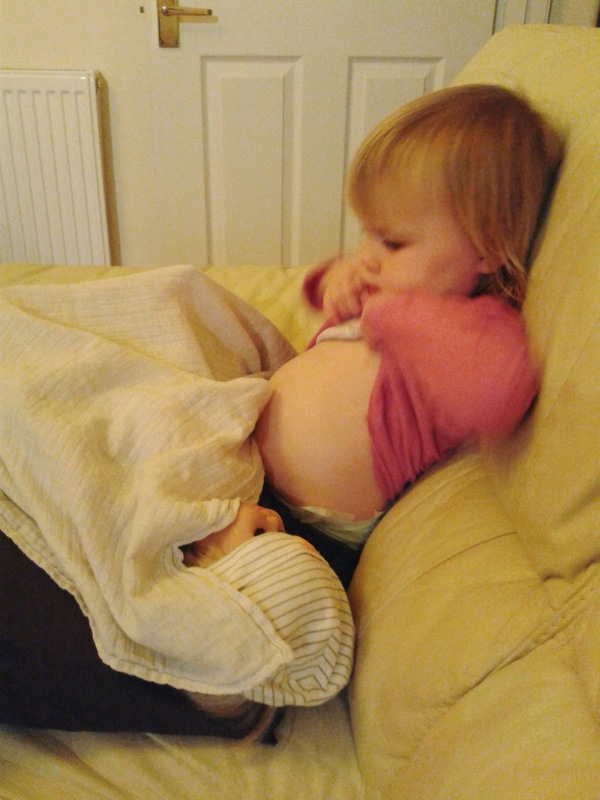 Baby has her nappy changed - E even tells me that Baby's done a poo sometimes - but Baby doesn't seem to need clothes. 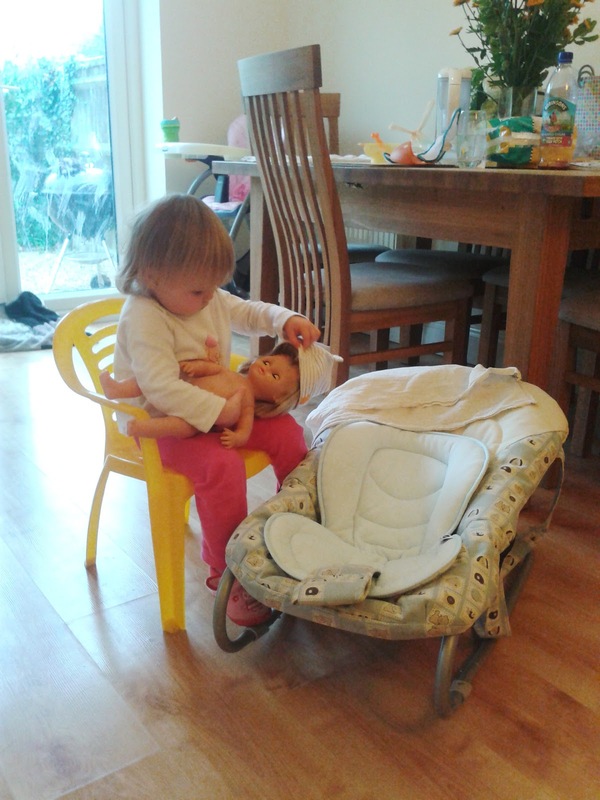 I've given E some newborn clothes to dress Baby in but this is either a silly idea to Elizabeth (because Baby has always been naked) or it's just too frustrating trying to get clothes on a dolly when you've only just learnt to dress yourself. Elizabeth is incredibly affectionate towards Baby. She'll pick her up and cuddle her, rock her to sleep in her arms (usually whilst shh-ing her), burp her after a feed and give her a dummy. She can often be found wandering around the room with Baby on her hip, hitching her up if she slips down (just like Mummy does) and talking to her and pointing at things as she walks. 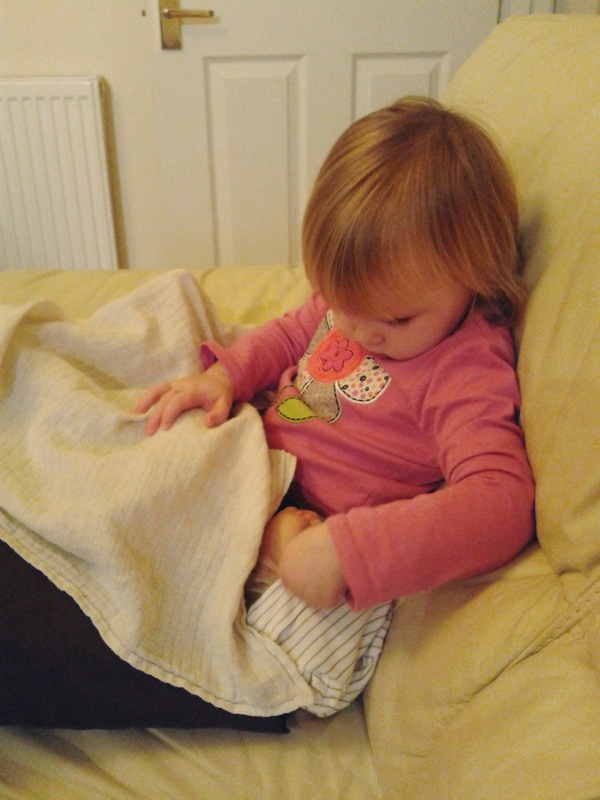 Whilst teaching Baby, Elizabeth is learning. Then of course she'll see something else to play with and Baby gets dropped on the floor. She can't be perfect!